Sergio Ramos has emerged as a transfer target for new Chelsea boss Andre Villas-Boas, after the Spain defender was involved in a contract dispute with Real Madrid. Villas-Boas is set to embark on a major squad overhaul after succeeding Carlo Ancelotti in the Stamford Bridge hot-seat, with bids for forwards Alexis Sanchez of Udinese, and Radamel Falcao of Porto in the offing. He is also looking to strengthen his defence by signing World Cup winner Ramos. Sergio Ramos is a key figure in Jose Mourinho's plans at Real Madrid, but club officials have refused to offer him an improved contract to replace his current deal, which still has two years to run. The 25-year-old's representatives believed they had an agreement in place that would see the player double his salary, but Madrid officials have said no to a pay rise. 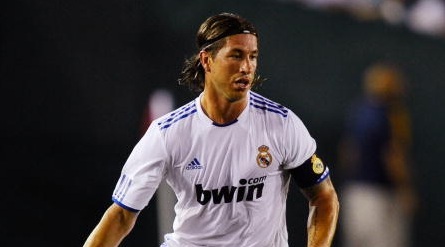 Ramos is said to be furious about the situation and ready to consider a transfer. Madrid apparently value the versatile defender at around £80 million, but Chelsea officials would be unwilling to come close to matching that figure for a player with such a poor disciplinary record. They will instead aim to strike a deal for around half that sum. He is a professional great footballer and very famous also. We know football is a very healthy game and it keep us away from many diseases so we should practice it to keep us healthy and fit. This post is giving us very nice information about essay writing service and about him and respect for him in our heart is increased by this.